The mobile SDK for Android increases your app's time to market by providing out-of-box support for LinkedIn natively inside your Android applications. This allows you to boost your sign in conversion rates and provides you more time to work on the things that matter. Single sign-on (SSO) authentication, in conjunction with the LinkedIn mobile app. A convenient wrapper for making authenticated calls to LinkedIn's REST APIs. "Deep linking" to additional member data in the LinkedIn mobile app. Sample application that demonstrate best-practice implementations of all of the SDK's features. This guide will walk you through the key concepts behind the new Mobile SDK and the steps required to get the included sample application up and running so you can start experimenting with the SDK as soon as possible. 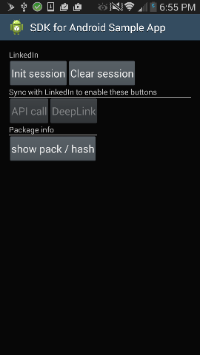 Download the latest release of LinkedIn's Mobile SDK for Android here. The Mobile SDK for Android requires the official LinkedIn Android application is also installed to support the SDK's capabilities. Due to Google Play store limitations on emulated Android devices, you will very likely want to acquire the LinkedIn APK file and manually install on virtual devices it for a smoother development and debugging experience. Download the latest release of the LinkedIn APK. There are several popular IDE choices available for Android development, including Eclipse with the Android Developer Tools plugin, JetBrains IntelliJ IDEA, and Google's Android Studio. Wroking with the SDK and sample applications requires that you have the Android SDK and build tools installed in your environment. The minimum supported version is Android 4.4.2 (API 19). Launch Android Studio and select "Import Non-Android Studio project"
Select the build.gradle file in the root of the unzipped Mobile SDK for Android archive. You should now be able to run the Sample App and Events App projects. Remember that the Mobile SDK-enabled applications require the official LinkedIn Android app to be installed on the device to function properly. If you're running the sample apps on a connected physical device, you can get the LinkedIn app from your app store. If you want to run the sample apps on an emulated Android device, use your emulated device's browser to surf to the developer website and download the LinkedIn APK file. For your convienence, there is a pre-built APK version of the Events App that is included in the SDK available for download for you to see without needed to build it yourself. You must identify your specific Android app with LinkedIn by adding some information about it to your LinkedIn application's settings. There are two types of key hashes: debug (i.e. development) and release (i.e. production). Debug keys are required for LinkedIn to verify the authenticity of your application while it interacts with our APIs during your development cycle. A release key is required because all Android applications must be signed with one before they can be uploaded to the Play store for distribution. We strongly encourage you to read Google's official Signing Your Applications documentation, specifically the sections regarding "Signing Considerations" and "Securing Your Private Key", to ensure that you fully understand the Android application signing process. Use the following command to generate a debug key hash value. The location of your debug key store will differ depending on whether you are developing on a Windows or Mac platform. If you do not have OpenSSL installed, you can download it for Windows or Mac/Unix. Before you can use any of the functionality in the mobile SDK, you must create an authenticated LinkedIn session. Learn more about how to authenticate LinkedIn users in the Android environment in the Authenticating with the Mobile SDK for Android guide. Once your users are authenticated, you can easily make calls to LinkedIn's REST API on their behalf. The APIHelper object provides helper methods for all of the necessary HTTP verbs. For complete details on all of the available API calls that can be made, consult the developer documentation. Make an HTTP GET request to LinkedIn's REST API using the currently authenticated user's credentials. If successful, a LinkedIn ApiResponse object containing all of the relevant aspects of the server's response will be returned. context - The Android Context that the API call is originating from. This value acts as a reference that will allow you to cancel this request in the future. url - The URL for the LinkedIn REST API endpoint that you wish to call. ApiListener - An implementation of ApiListener to handle the response from the API call. The onApiSuccess() and onApiError() methods should be overridden to handle the result of the call in a manner that makes sense to your application. // Error making GET request! Make an HTTP POST request to LinkedIn's REST API using the currently authenticated user's credentials. If successful, a LinkedIn ApiResponse object containing all of the relevant aspects of the server's response will be returned. body - A JSONObject or String containing the body of the request. // Error making POST request! Make an HTTP PUT request to LinkedIn's REST API using the currently authenticated user's credentials. If successful, a LinkedIn ApiResponse object containing all of the relevant aspects of the server's response will be returned. ApiListener - An implementation of ApiListener() to handle the response from the API call. The onApiSuccess() and onApiError() methods should be overridden to handle the result of the call in a manner that makes sense to your application. During your application's workflow, you may wish to cancel any in-progress API requests. This is done by calling APIHelper.cancelCalls() method. This call is generally used when a user closes or otherwise modifies a UI element that is in the process of looking up LinkedIn member data. When the current fragment or context is dismissed, your application's performance is increased by remembering to close any pending API requests it's waiting on that are no longer relevant to the new state of the application. context - The Android Context that was provided to the original API call helper. All in-progress API requests associated with this application context will be cancelled. The mobile SDK provides you the capability to "deep link" to a specific member's profile directly within the official LinkedIn mobile application. This method will open the currently authenticated user's LinkedIn profile directly within the official LinkedIn mobile application. Users have the right to see more information about themselves than of other members, so you should use this method rather than openOtherProfile() with the current user's member ID, when trying to link a member to his or her own LinkedIn profile. activity - The Android Activity to return the user to if the user presses the "back" button on their device while inside the official LinkedIn application. callback - An implementation of DeeplinkListener that will handle the response from the call. The onDeepLinkSuccess() and onDeepLinkError() methods should be overridden to handle the result of the call in a manner that makes sense to your application. memberID - A String representation of the ID of the member whose profile you want to send the user to. If you are using the currently authenticated member's ID, you should consider calling openCurrentProfile() to enable the display of additional information from the member's own profile, instead. The memberID is a value that is unique to your particular LinkedIn application, representing a specific LinkedIn member. You can retrieve the current user's id by making a REST API call to LinkedIn's Profile API using the SDK's API wrapper method. Storing member ID values on your own server allows your application to direct users to the official LinkedIn profiles for any other users that have authorized your mobile application.